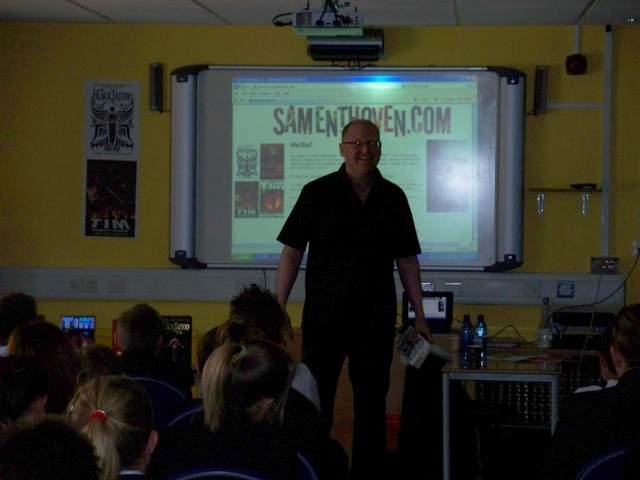 Herewith a couple of quick pics from today’s brilliant visit to Hassenbrook School, in Stanford-le-Hope, Essex (UK). First up, a Spaghetti Western-style widescreen shot to give you a flavour…! And this (below) which shows pretty clearly how the warm welcome that I received there made me feel…! This visit was a lot of fun. The Year 7 and Year 8 students in all three sessions asked excellent questions and I had some great chats while signing in the library at lunchtime. A giant monster thank you to Ms Brockwell for inviting me (and taking these pics). Thanks, too, to everyone I met and spoke to, but especially to Ricky for helping out (and listening so politely to all three talks!) and to Jordan for suggesting some fabulous possible book titles! Tomorrow I’m off to the awesome Crystal Palace Children’s Book Festival! I’ll be in The Bookseller Crow bookshop from about 2pm, so if you’re in the area do drop by.